Interested in reading up on the latest trends in educational technology? Be sure to check out the Educational Media and Technology Yearbook at the St. Kate’s St. Paul library. 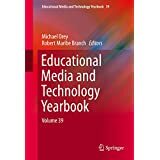 This annual publication, in its 40th year, covers educational media and technology topics and the programs that prepare professionals in this area. By jphillyard in Research on March 4, 2016 .